It comes from the root of the yuca plant. It's gluten-free, grain-free, and even nut-free — making it the perfect flour for those with allergies or those who need to be on a grain-free diet. The neutral flavor of cassava lends itself well to forming the base of a meal. Its taste and texture satisfy just like normal bread, without detracting from the rest of the dish like some grain alternatives can. 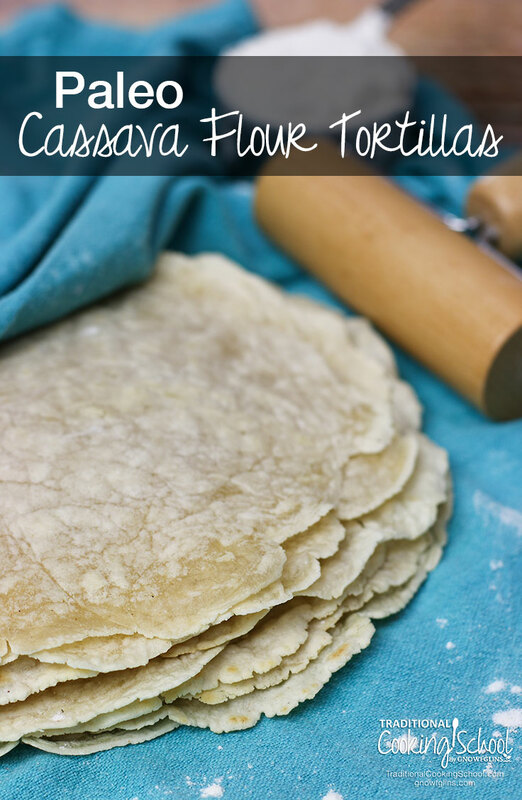 I've used these cassava flour tortillas for tacos. They're a great choice for this role because they're pliable and elastic, and they don't tend to crack or pull apart when filled with toppings. I really enjoy working with this dough. The granule of the flour is fine and soft, and when combined with water and oil, the dough handles well and rolls easily. Cassava flour is my favorite grain substitute to date... So far, I've made cassava flour tortillas for tacos, which are pliable, elastic, and don't tend to crack when filled with toppings! Makes 10 to 14 tortillas, depending on size. Combine flour, salt, and olive oil in mixing bowl. Add 1 1/2 cups water. Mix until evenly distributed, and oil and water are absorbed. Knead, adding enough additional water for the dough to hold together without crumbling. Make sure the water is being worked to the inside of the dough mass. Take a small portion of the dough, roughly egg-sized, and place it between 2 sheets of parchment paper. 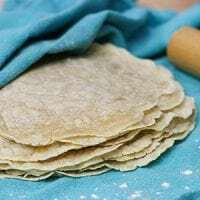 With a rolling pin on the top layer of parchment paper, roll out the tortilla to about an 1/8" thick and a diameter that will fit inside your 10" or larger cast iron skillet (mentioned below). As you're rolling out, smooth out any ridges that appear along the edges. Remove the top layer of parchment paper. The tortilla may stick, so roll back gently to prevent tearing. Heat a dry 10" or larger cast-iron skillet to medium-low heat. Transfer tortilla from the bottom layer of parchment paper into the middle of the skillet. I lay the tortilla facedown on the palm of my dominant hand, then to prevent tearing, carefully peel back the parchment paper, starting from the thickest edge of the tortilla. Once tortilla is in the skillet, watch for the edges of the tortilla to curl up, and bubbles to form in the dough. Then it's ready to be flipped! Once you see bubbles and the underside is browned, flip the tortilla. After the second side is lightly browned, remove tortilla from skillet. Undercook rather than overcook -- this is the key to soft tortillas. Place inside towel or container to keep warm. Repeat for all tortillas, adjusting the heat up or down as necessary so they don't get overcooked or burned. While still warm, put the stack of tortillas, sandwiched between 2 layers of parchment paper, inside a zipper-seal bag. This helps to keep them soft. Serve with taco meat and toppings, or any other fillings your heart desires. 🙂 Enjoy! Refrigerate leftovers. When chilled completely, any that are overcooked may become hard or brittle, but they are easily softened up by heating them in a dry skillet. Have you used cassava flour in your kitchen? Will you try these cassava flour tortillas? Have you ever made paleo tortillas? This post was featured in 60 Easy & Nourishing Picnic Recipes. Naomi, Wardee’s second daughter, enjoys baking, writing, learning about agriculture and the life sciences, and reading outside in the sun. 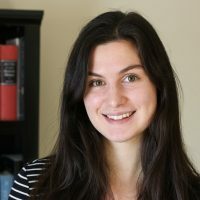 In her baking, she primarily focuses on grain-free and gut-healing methods. What is the carbohydrate content of these tortillas or of cassava flour in general? Janet, that was my first questions as well since I’m a Type 2 diabetic. I looked up the nutritional content of cassava flour, and it’s 78 grams of carbohydrates per cup (cornmeal is 125). So this recipe would have 12.5 grams of carbohydrate each if making 14 tortillas and just over 14.5 if making 12, which is probably what I would aim for (just seems easier to portion 12). Actually, I’d probably halve the recipe if I was planning to use only for tacos or sandwich wraps, and if I make a full recipe, it would be better to plan on freezing half of them as filled burritos or enchiladas. And it would be interesting to see how they fare if baking or frying them to make tortilla chips. Thanks! I’m pre-diabetic and this was also my first question when I saw this recipe. I have made cassava tortillas with a very similar recipe and they are great. I think they are best when fresh, so I make a very small batch. Worth getting a tortilla press for. I have a tapioca sensitivity. Do you know if I can eat these? I tried this recipe today. What a disappointment! The dough came together easily enough – but apart from the complete inability to remain cohesive, it turned into an inedible plank in the pan- the one tortilla I manage to lever out intact. Thinking I should perhaps add a bit more water, (I had only added one cup to this point,) it then stuck sullenly to the bottom of my non-stick pan and shredded off! What an enormous waste of money and time! I had the same thing happen today. And what I did was lightly oil the pan in between each tortilla. I was lucky enough to have duck fat, and used that. Typically I’d use lard or tallow, which I always have on hand. Since it is a lower heat setting, olive oil would work too. I think that using a small bit of oil (like a very full 1/2 teaspoon) made it so that I didn’t get the air bubbles. My tortillas also look very different in color and I don’t know that they would fold over well or be able to be used as a wrap. I still had only about 3/4 of the rest of the batch in what would be a full tortilla. Some still cracked. Don’t know if I’m up to trying tortillas again. I had also tried making a Cassava flour brownie recipe and they were ready several minutes before the minimum time frame given in the recipe. They had good flavor, but were dry and chalky. I will say that Cassava flour (and arrowroot) make a nice and sturdy pizza crust though. My favorite thing to do with cassava flour is to make Brazilian style tapioca with it (called beijus in Bahia). You take the tapioca flour, put it in water, enjoy watching a non-newtonian solid for a while. Then, drain off the water and put out on towels to dry as a solid. Once a nice solid, throw in the food processor to turn into grains (think a really chunky sea salt). That can be stored in an airtight container for a week or more. To use take about 1/2 cup and sprinkle it evenly into the bottom of a super-hot pan (about 6-7″). Then, you can put your toppings of choice on top — the Brazilians use both savory and sweet. Some favorites are nutella and banana (wtih or without flaked coconut), anything with condensed milk, jelly and soft cheese. For savory they do a lot with soft cheeses and meats (shredded beef or chicken). At home I do a lot with provolone and ham or turkey (or both). The recipe on the bag of “Otto’s” cassava flour is the best. I add a little extra salt and some pepper to the dough for added flavor. I heat up 2 “heavy” non stick pans while I mix up the dough. I press the tortillas (not too thick) with parchment on both sides. Peel one side and put the parchment back on, flip it and peel the parchment off the other side. This way when the pan is ready you can easily flip the tortilla into your hand and then into the pan. This way I’m pressing the tortillas as the first ones are cooking. Hints: 1. Get a very flat tortilla press that doesn’t have raised edges. 2.I weigh my cassava flour for consistency then I weigh the dough so I can divide it into equal sections by weight and roll them in a ball to make the correct number of tortillas that are all the same size. Since the dough is not sticky I can toss these balls on top of each other into the bowl I used to mix it in the first place, then just grab them while I’m pressing. 3:When I’m watching TV I cut out a lot of parchment circles and store in a gallon Zip Loc bag. Sounds like a lot of instructions but once you’ve done these a few times it goes fast.